This story was updated and condensed after Fusion was contacted by Clean Vibes, LLC to correct and clarify names, titles and some other details. Bonnaroo, the 4-day music and arts festival that takes place on a 700-acre farm in Manchester, Tennessee, hosts around 80,000 to 90,000 people every year. Of course, large events and festivals hire waste management companies to clean up the mess. 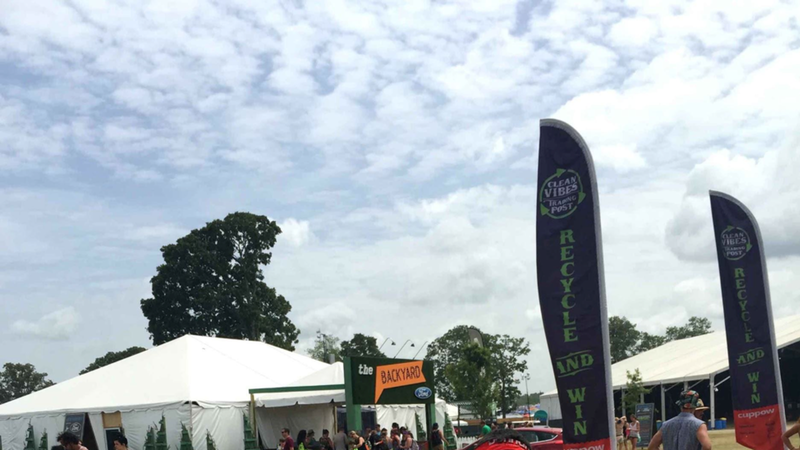 But at Bonnaroo and other festivals such as Governor's Ball, organizers are taking it a step further by getting festival-goers involved in reducing the waste footprint of these massive events. At Bonnaroo, a company called Clean Vibes, LLC oversees a volunteer program in which people can attend the festival free of charge in exchange for their work. Clean Vibes coordinates the entire recycling and waste management program for the event, and they also come up with creative ways to encourage attendees to reduce their footprint through their nonprofit arm, the Clean Vibes Trading Post. We spoke to a few Clean Vibers. Meet the people who clean up your trash (and more) at Bonnaroo. “Think about it, if there are 10 people out there who are going for the hammock, that’s 6000 points, so that’s like 40 or 50 bags of trash off the Earth. “Landfill trash is a really small selection of things. Like cigarette butts and anything else [non organic] that crinkles like a potato chip bag. Is this your first time with Clean Vibes? Why do you love Bonnaroo?